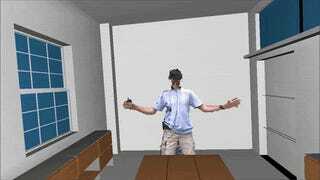 Set up three Kinect cameras in an equilateral triangle, use an Oculus Rift as a head-mounted display, merge all that with a virtual office environment and you got yourself your own 3D conference room... with some glitches. But glitches could make any boring presentation or conference a lot funnier. I decided to embed the live 3D video into a virtual 3D model of an office, to show a possible setting for remote collaboration / tele-presence (more on that coming soon), and to contrast the "raw" nature of the 3D video with the much more polished look of the 3D model. One of the things we've noticed since we started working with 3D video to create "holographic" avatars many years ago was that, even with low-res and low-quality 3D video, the resulting avatars just feel real, in some sense even more real than higher-quality motion-captured avatars. I believe it's related to the uncanny valley principle, in that fuzzy 3D video that moves in a very lifelike fashion is more believable to the brain than high-quality avatars that don't quite move right.